The role of art, at it’s most brave and brazen, has always been to provide unflinching reflections of reality. Music, the purest of all art forms, has the ability to crystallize moments and make history tangible. We’re living in the midst of current and historical pain, each new individual moment of destruction and despair opens deep wounds. From the opening sax notes, “We Could Be,” is a daring record in the tradition of grassroots music from the 60’s and 70’s. Bittersweet, it acknowledges the imbalance of pain within our communities. Bold, it refuses to buckle under that pressure and instead, it asks of us to step into the promise of previous generations. It proposes that we could be closer to freedom. 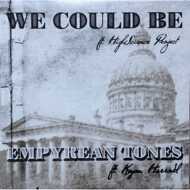 While the lead track is a hard and hopeful aspiration, the flip side, “Empyrean Tones,” is the mind flight. This is where the heaviness of before dissipates like smoke and we are allowed to dream. Jason McGuiness, the projects’ producer, is in the old-school tradition of producers who need not pick up an instrument. With a vision and purpose, McGuiness culled an experienced group of music makers to create something that would reflect us back to ourselves. The instruments you hear are wielded by masters who have shared their talents with the likes of D’angelo, Kendrick Lamar, Kanye West, Robert Glasper, Aloe Blacc and more. But they’ve never done something quite like this. From Te’Amir’s drums to Mark de Clive-Lowe’s keys, up to Keyon Harrold’s sublime horns and TheHighScienceProject’s timeless vocals, the magic here is in the submission of the individual in reverence of the collective.